The Dreamy bags are comfy sleeping bags for your Rats. All the Rat Warehouse sleeping bags are handmade here in Somerset? That means that I do offer a custom service. If you would prefer a different colour combo or a plain colour fleece sleeping bag, please email and ask, chances are I will be able to make it for you! Handmade items are made to order so please allow 2-3 working days minimum for orders to ship. As usual, orders are usually sent quickly but in busier periods it may take a little more time. The Dreamy Berry is a comfortable sleeping bag for your pets. It is made of soft purple fleece and lined with a lush lambskin-like fleece fabric for extra comfort. Measures approximately 10x14 in. The Hot Pink Dreamy is a comfortable sleeping bag for your pets. It is made of soft pink fleece and lined with a lush lambskin-like fleece fabric for extra comfort. Measures approximately 10x14 in. The Gloomy Black Dreamy is a comfortable sleeping bag for your pets. 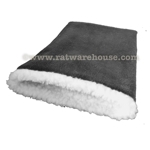 It is made of soft black fleece and lined with a lush lambskin-like fleece fabric for extra comfort. Measures approximately 10x14 in. The Pirat Dreamy is a comfortable sleeping bag for your pets. 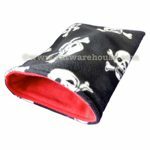 It is made of soft black fleece with a white skulls and crossbones print and lined in soft lambskin-like fleece fabric for extra comfort. Measures approximately 10x14 in. The Pirat Red Dreamy is a comfortable sleeping bag for your pets. 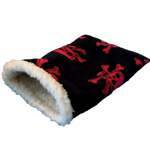 It is made of soft black fleece with a white skulls and crossbones print and lined in soft plain red fleece. Measures approximately 10x14 in. The Jolie Coccinelle Dreamy is a comfortable sleeping bag for your pets. 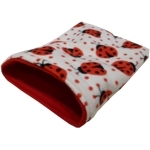 It is made of soft colourful ladybird print fleece and lined in plain red fleece. Measures approximately 10x14 in. Dream of Unicorns Dreamy is a comfortable sleeping bag for your pets. 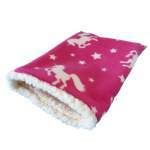 It is made of bright pink fleece with a white unicorn and star print, lined with a cream sherpa fleece for extra comfort. Measures approximately 10x14 in. The Bloodmoon Pirate Dreamy is a comfortable sleeping bag for your pets. It is made of black and bloodmoon pink skull print fleece and is lined with a lush lambskin-like fleece fabric for extra comfort. Measures approximately 10x14 in. The Urban Dreamy is a comfortable sleeping bag for your pets. 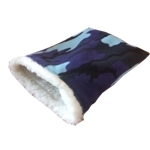 It is made of soft purple/black/pale blue camo fleece and lined with a lush lambskin-like fleece fabric for extra comfort. The Cherry Red Dreamy is a comfortable sleeping bag for your pets. 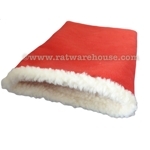 It is made of soft red fleece and lined with a lush lambskin-like fleece fabric for extra comfort. Measures approximately 10x14 in. The Dotty Dreamy is a comfortable sleeping bag for your pets. It is made of soft red fleece with a black dotty print and lined in soft lambskin-like fleece fabric for extra comfort. Measures approximately 10x14 in. This sleeping bag was designed specifically with the elderly Rat in mind. The dimensions are the same as our Dreamy but the Old Bag has a larger opening, providing easier access for those old darlings, particularly those who suffer with HLD or simply have wobbly old legs. A nice comfy bed for the Older Rattie in cool Berry fleece, lined with lush lambskin-like fabric. The Unique Snowflake Dreamy is a comfortable sleeping bag for your pets. 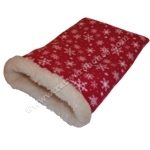 It is made of soft colourful red and white snowflake print fleece and lined in sherpa. Measures approximately 10x14 in.